My life-long love affair with mermaids is no secret. I’ve painted mermaids often, and I’m happy to report that Bealls likes them too. 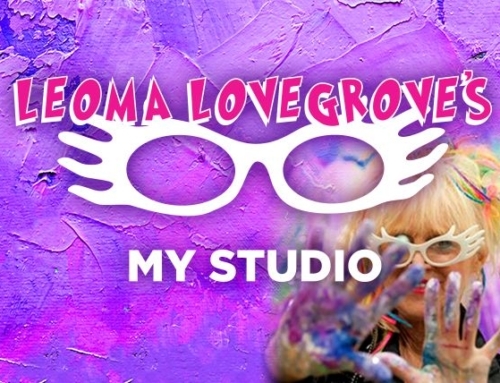 The photo here comes from my Florida Floats My Boat series and is among sixteen paintings Bealls featured in its Leoma Lovegrove product line. But did you know that Fort Myers has its very own mermaid. It’s true, and her name is Lorelei and she’s 137 years old! 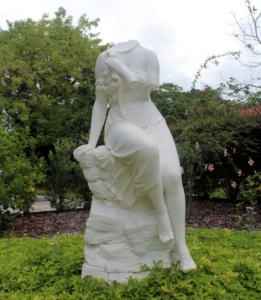 Fort Myers’ seductive siren came here when she was 50 years old. 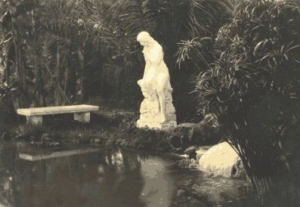 She’d been living in Italy, but then she met a member of the Periwinkle Garden Club by the name of Evelyn Rea, who decided she’s love the waters of the Caloosahatchee River that flowed past her residence not far from the Burroughs House. 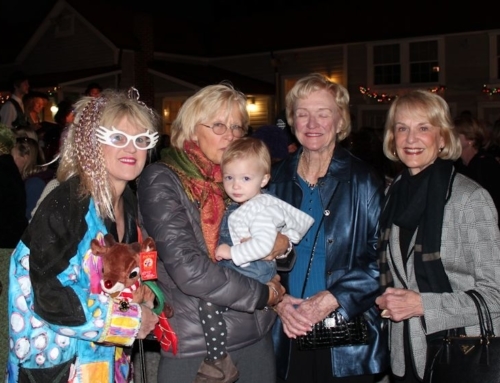 Lorelei was a big hit. 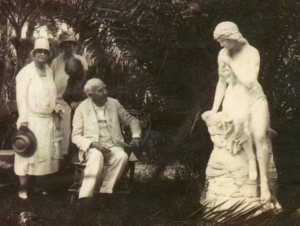 In fact, Thomas and Mina Edison were among the locals who dropped by to welcome her to the community. No one knows whether the siren missed the Rhine River valley, where her doppleganger lives on a rocky incline across from Rheinfels Fortress in St. Goar not far from Schoenberg Castle in Sankt Goarshausen. According to legend, the Rhine River’s Lorelei was a distraught young maiden who threw herself into the river in despair over a feckless lover. She was transformed in death into a siren or mermaid whose hypnotic music ever after lured sailors and fishermen to their death. Of course, our Lorelei has a much different story. She was carved from Italian marble – but not by a sculptor from Rome or Milan, but a woman from Boston, Massachusetts by the name of Emma Elisabeth Phinney. Imagine. In 1880, sculpture was the sole and exclusive province of men. But there was Emma Phinney, studying at the Royal Academy of Fine Arts, the best art school in the ancient city of Rome. Emma was soo good that she became one of the first women to receive a degree from the Royal Academy. 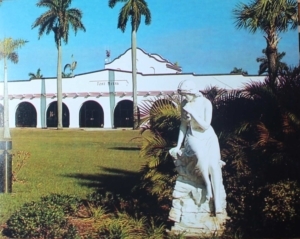 When Evelyn Rea died in 1959, Lorelei was forced to leave her picturesque river view for the dark and dreary confines of the Lee County Fort Myers Library next door to the old Seaboard Coastline Railroad Depot on Peck Street and across the street from the bus station. Instead of the slow flowing waters of the broad Caloosahatchee, she was forced to stare at the entrance to the library as Greyhound buses perfumed the air with noxious exhaust fumes. But then, something even more horrible happened to our poor siren. Two nights before Halloween twenty years ago this year, one or more vandals knocked her head off along with a piece of one arm and some toes. The culprit(s) were never caught and the missing parts were never recovered. The library eventually moved downtown, leaving Lorelei behind. And when the city decided to tear down the old structure and replace it with a brand new fire station, Lorelei had to find a new home as well. 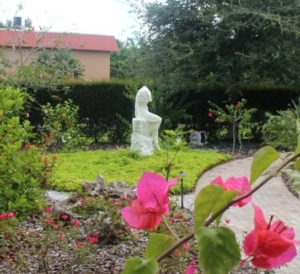 Fortunately, a new generation of Evelyn Rea’s friends in the Periwinkle Garden Club and the Fort Myers Lee County Garden Council lovingly took Lorelei to live with them in the Berne Davis Hibiscus Garden. And that’s where you can see our pretty little siren today. 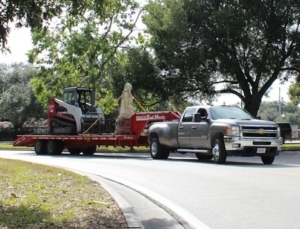 The Garden Council is located on Virginia Street, not far from the Edison & Ford Winter Estates. It’s worth making a pilgrimage there to visit Lorelei. And by the way, if you know where her head is, she’d appreciate it if you’d bring it along with you. No questions asked. 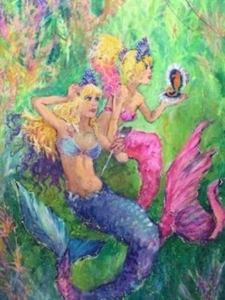 While the Bealls painting is not available for purchase, other mermaid paintings are. 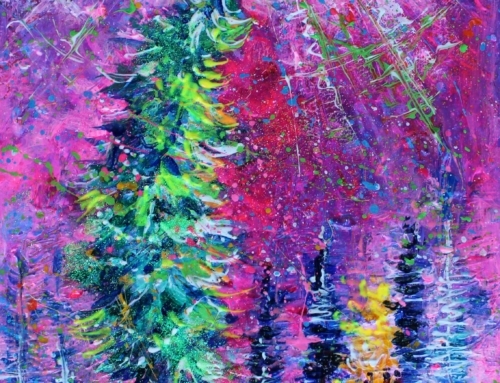 Some originals are available; others are available in prints. 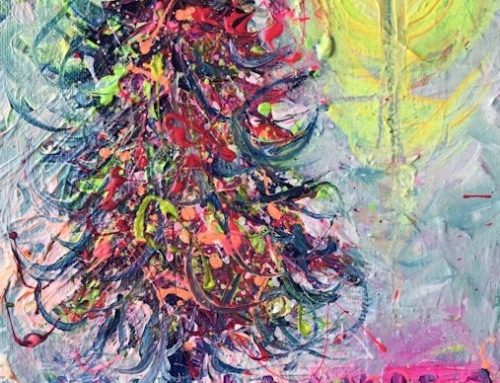 Just contact the gallery for information and pricing.